Named for the 5 select hop additions, this is a refreshing pale ale with a lively hop flavor and aroma. 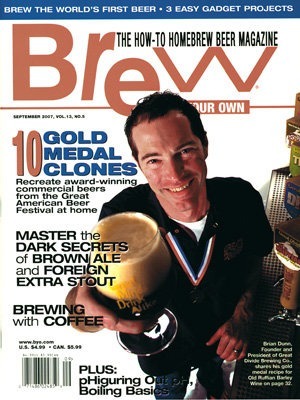 Winner of the 2006 gold medal at the GABF. Old Ruffian is a hefty, hop-forward barleywine with subtle fruit aromas and complex caramel sweetness. This beer should be bitter and have a nice “Spalty” nose to it. But to keep the hops from overwhelming the palate the malt has to come through as well. The roasty undertones of the Munich and Vienna malts complement the aggressiveness of the hops very well. Big Time Brewing’s Goddess Porter clone Big Time Brewing, Washington’ (5 gallons/19 L, all-grain) OG = 1.060 FG = 1.018 IBU = 33 SRM = 31 ABV = 5.5% Ingredients 9 lb. Is yeast presence a major head retention inhibitor? There are some brewing topics I address because I have been asked, and some subjects I opine about whether asked to or not. And there are some things I tend to avoid. What (exactly) is pH and what can – or should – a homebrewer do about it? You may not know much about it (and depending on your water and the beers you brew, you may not need to), but pH affects many major aspects of beer character. Learn the simple steps to manage pH in your homebrews.